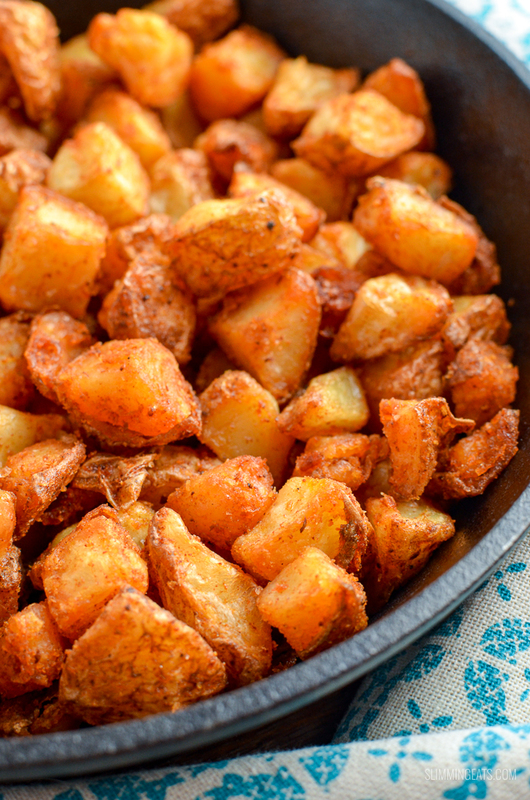 Syn Free Seasoned Crispy Home Fries – the ultimate breakfast side to accompany your eggs, bacon or sausage. 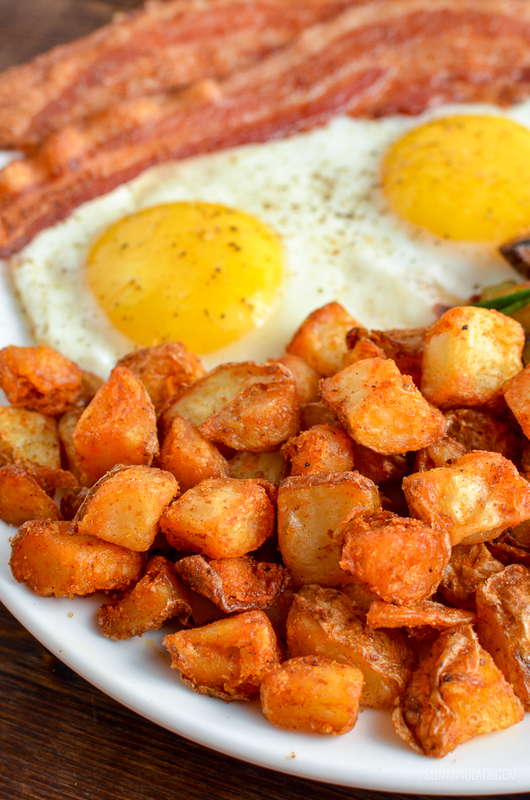 Order breakfast at a diner this side of the Atlantic and you are pretty likely to see Home Fries on the menu. Normally fried in butter in a skillet until crispy but fluffy on the inside, they are a popular choice for breakfast. 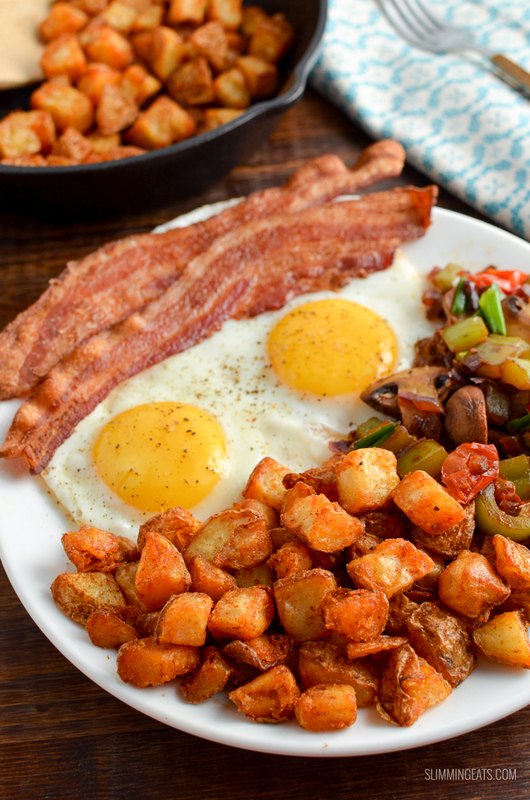 We have a local diner here that is one of my favourite choices for breakfast and whenever I go there, I will happily blow all my daily syns on their home fries, which are seriously amazing. 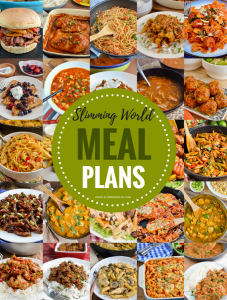 So there seemed no better idea than to create my own syn free version I could enjoy at home. There are two options for cooking these, you can either cook these in the oven, or in the Tefal Actifry, The added bonus of course about the Actifry is that you don’t need to rotate the potatoes to get an even browning, the actifry does it all for you. 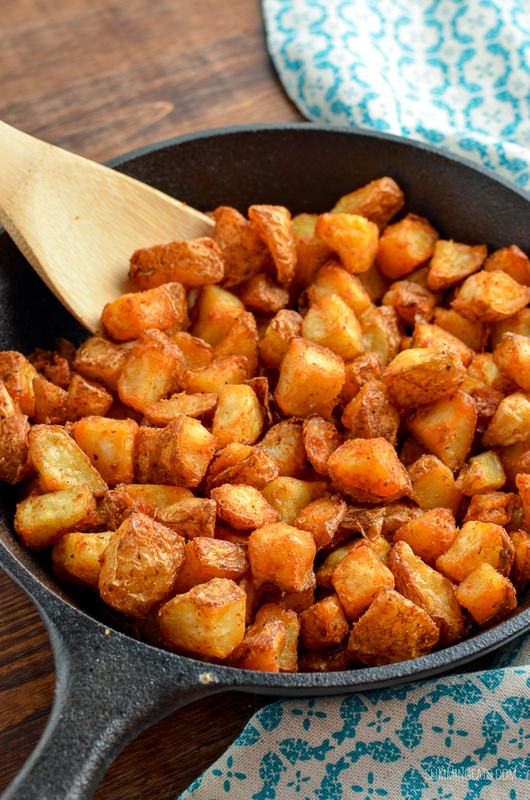 The key to getting the perfectly golden crispy seasoned Home Fries is part cooking before the browning process, and not adding the seasoning too early. You may be tempted to rush these and skip the parboiling stage, but trust me even when cooking these in the actifry, you won’t get the same result if you don’t parboil these first. I will often make up a big batch of these to last a few mornings, as they can just be readded to the oven or actifry to heat up. So if you want to make these the night before to save time, then go right ahead. How can I add a 1/3 speed foods to these Syn Free Breakfast Home Fries? I served mine with some sauteed mushrooms, onion, peppers and tomatoes. I just sauteed them in a pan with some cooking all spray, also using a little bit of stock to prevent from sticking, just keep reducing down and adding a little bit more. It’s a great method for sauteing vegetables without the need for lots of oil. I use it as a method for these Garlic Sauteed Mushrooms. All that is left to decide, is what else to serve these delicious Syn Free Breakfast Home Fries with. I went for eggs and some crispy oven baked streaky bacon. 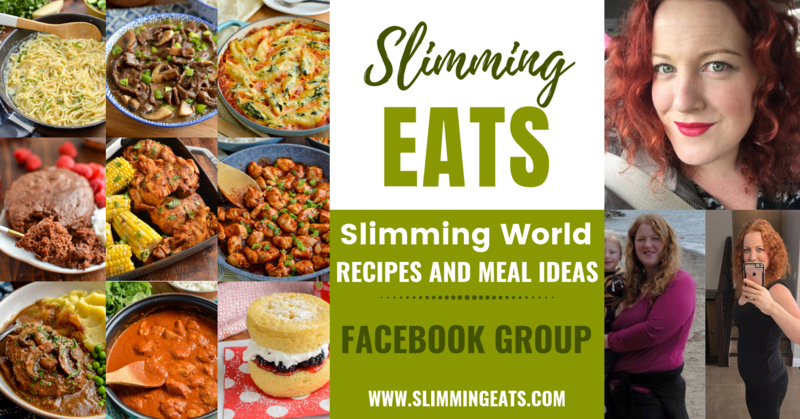 Yes I know back bacon is syn free, but your syns are there to use on what you want and we love crispy streaky bacon. Yum!! 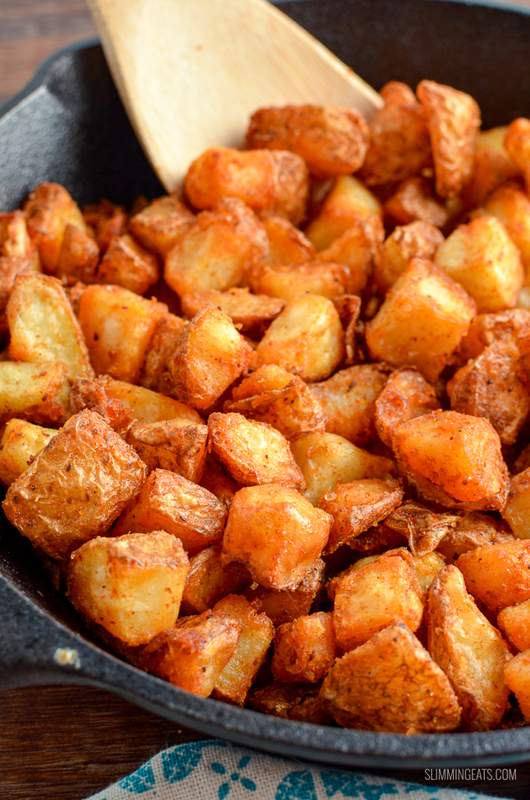 What Kitchen Items do I need to make this Syn Free Breakfast Home Fries? 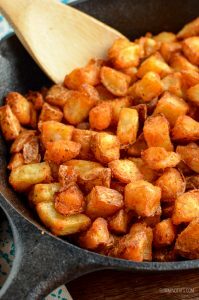 Syn Free Seasoned Crispy Home Fries - the ultimate breakfast side made healthier by cooking in the oven or Actifry. Add potatoes to a saucepan, cover with water, bring to a boil, then turn off heat and leave in water for 5 mins. Add to a baking tray, season with the salt and spray with some cooking oil spray. Bake for about 20 minutes until lightly golden. Mix together the paprika, onion powder, garlic powder and black pepper. When the potatoes are lightly golden, remove from oven, sprinkle with the season and move around on the tray to fully coat. Spray again oven the top with cooking oil spray and bake for approx another 20 minutes until golden and crisp. Serve with your breakfast sides. 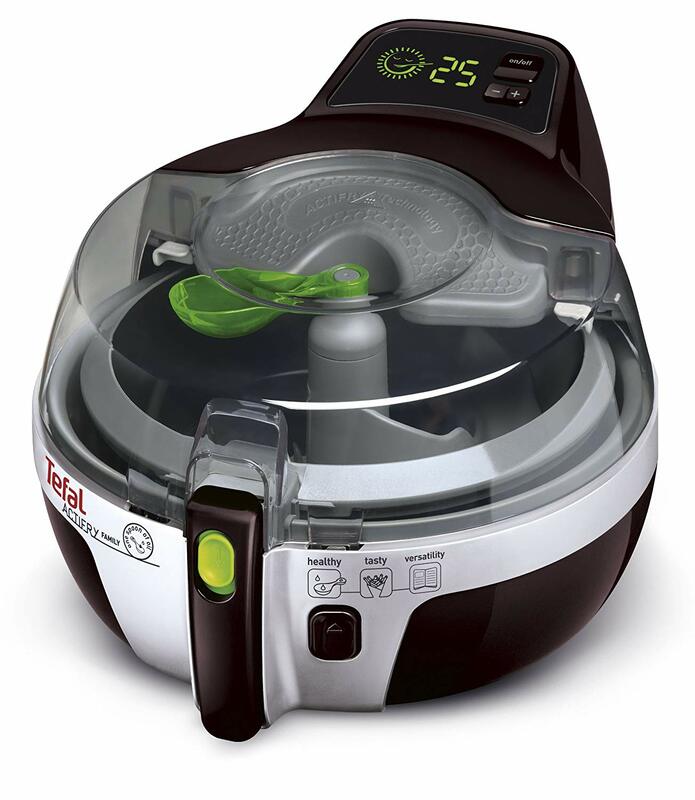 Add the potatoes to the actifry and turn on just to dry off any water. Remove the pan from the actifry and add the salt and spray with cooking oil spray, shake to coat. Add the pan back to the actifry and set for 15-20 minutes until lightly golden. Remove the pan from actifry again. Add the pan back to the actifry and continue to cook until golden and crispy.